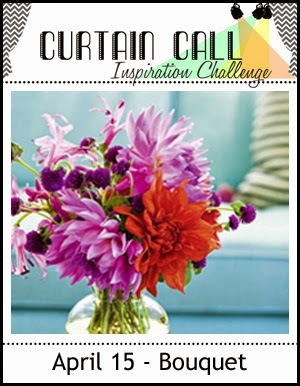 Don't you just love the colours in the inspiration photo? I want to capture them and the colours that most closely resembled them for me were from my Distress Inks--Crushed Olive, Persimmon and Dusty Concord. Now I can't use Distress Inks without doing something with them so I decided that I wanted to use water. With my recycle bin full of fails I finally settled on this card. I applied the inks to the stamp using my mini Distress Inks for more control then I gave the inked stamp a mist of water and stamped it on to the smoother side of my watercolour paper. The ink wasn't bleeding quite enough so I misted the card panel lightly again after stamping. I wanted a bit more but decided to let it go, the recycle bin was full enough. 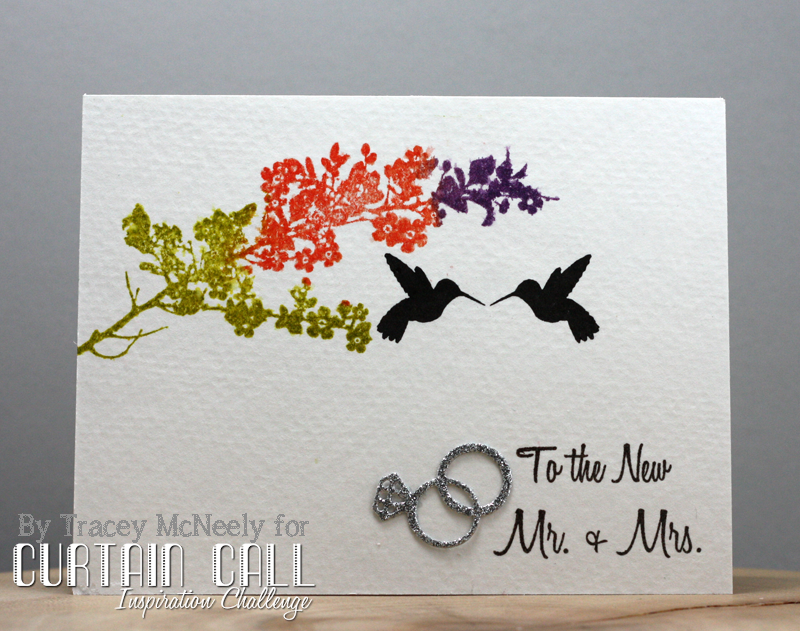 I stamped my birds and my sentiment and topped it off with the silver glitter wedding rings. Such a pretty card Tracey! I have to agree the colors are so lovely and I love the stamp set you used!! You're braver than I am, I still haven't tried distress inks!! I know, sad huh. I love those cute little hummingbirds. 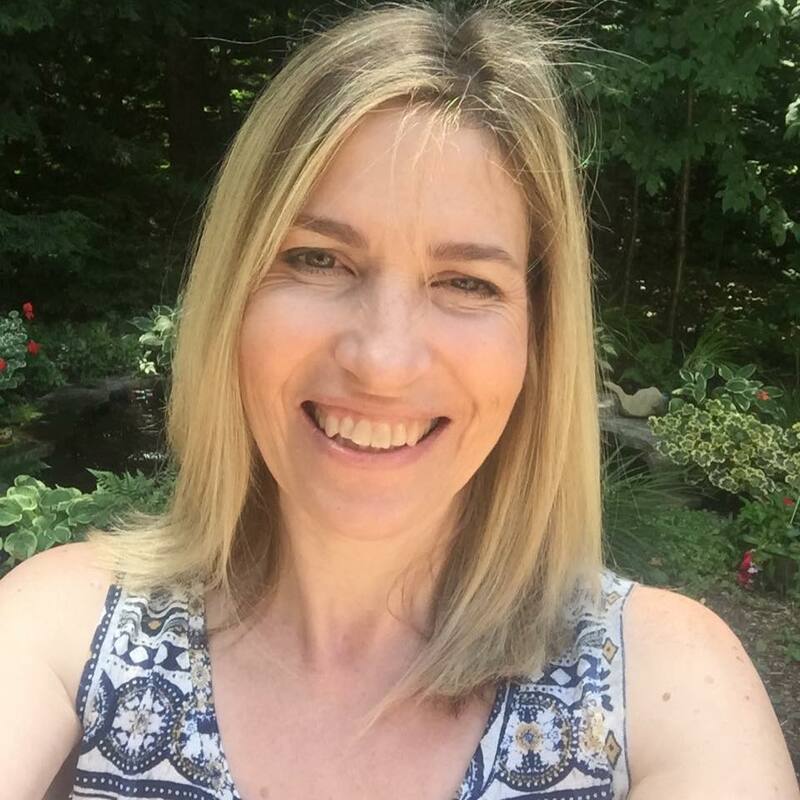 This is pretty Tracey! This is so very pretty Tracey!! Very pretty, Tracey. 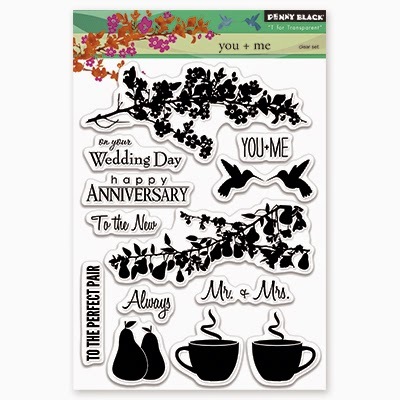 I do so wish I had Penny Black products! Beautiful! I love the way you've stamped those stems! Beautiful stamping. Love your design and those hummingbirds. Wait, you didn't use the coffee cups from that set? (I'm thinking the colors of the bouquet, or a flower on the mug)... beautiful card, I'm just giving you a hard time. Such a lovely card, Tracey! Love how you stamped the flower! And, wonderful shiny rings! what a beautiful card.. love those cool rings and the love birds are perfect.. I love how you played with the colors and the wedding rings are so beautiful! Stunning card as always, Tracey! Serious watercolor beauty, Tracey! And those rings... LOVE! So pretty! I love those colors and those wonderful hummingbirds - in love! Beautiful card. Love how your flowers look sort of dreamy. And those birds and wedding rings are perfect additional touches. Adore the hummers and what a fun touch with the rings. So pretty Tracey. Love the different colors on the silhouette image. Gorgeous watercolored flowers, Tracey! And I love those wonderful silhouetted hummers! Gorgeous! Love the watercolor flowers an the bling rings! Beautiful wedding card Tracey...love the sweet colors and your images are just perfect! 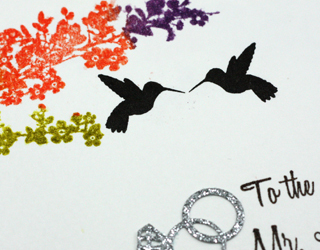 Glad you persevered with the distress inks, Tracey, because your card is ever so pretty! I continue to struggle with water-colour...grr! Oh well, that's okay...I'm happy with inks, dies and stamps!